BBC NEWS | Americas | Does US insecurity put liberty at risk? Does US insecurity put liberty at risk? In awe at the inspiring keynote speech about America's tradition of freedom made by Harvard historian Dr Bernard Bailyn. In shock at one particular display of America's post-9/11 insecurities and hyper-vigilance. 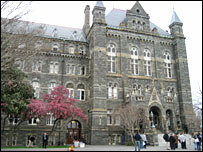 The university is located in the well-to-do Georgetown neighbourhood of Washington DC. I was there to support a graduating classmate. Sitting in the front row among proud parents, family and friends of graduating students, I was captivated by the speaker's words. "Nations and people do have dominant characteristics, and it's a good time, a necessary time, to think briefly about our own essential characteristics. What others think about us, how we see ourselves, and how we actually are, matters." But, the sense of awe did not last long. Two portly university security guards brought me back to reality. Officials at Georgetown say they have strict policies prohibiting racial and ethnic profiling, and have begun an investigation into the matter. Given this, the guard's cultural insensitivity took me by surprise. But observers note that this kind of singling out has become pervasive in the US since the terror attacks of 9/11. A quarter of Muslim Americans say that, in the past year, "people have acted as if they were suspicious" of them, according to a new Pew Research Center study. But, as my case demonstrates, this phenomenon is by no means limited to the Muslim community. "People who are perceived to be Muslims, that are Middle Eastern, are being disparately treated," says Arsalan Iftikhar, the legal director of the Council on American-Islamic Relations. "A Sikh, who is not a Muslim, gets attacked and gets told, 'terrorist go home'." Arshiyar Ali Shirazi, a Christian Iranian-American who has lived in the US since the age of two, recognises this trend. Having graduated from university and dreaming of landing a job with the government, he goes by a more "American" name, Al. "I figured since the 'from' line in a recruiter's inbox is the first thing they see from you, why risk associating a strong resume and solid qualifications with a Middle Eastern-sounding name? "Most people see names like Ali, Mohammad, Abdul, Reza and automatically associate them with the Middle East and terrorism." Apparently, one of these challenges will be how America can address its insecurities, compounded by 9/11 and the immigration debate, all the while preserving its ideals of "liberty and justice for all". Muslim American: A new identity?